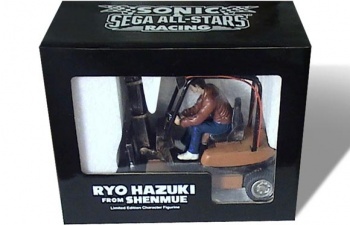 If you're a fan of the long dormant Shenmue series, this special "Ryo Hazuki driving a forklift" figure might soothe the wound in your heart. Or it might make it worse. Let February be forever known as "the month where Sega messes with the hearts of people who liked Shenmue." First, there was the revelation that the company "still thinks" about the series (but not enough to warrant making more games to continue Ryo Hazuki's story of revenge), and now there's this limited edition figure of Ryo himself driving a forklift. "But John," you may be asking, "How do I get this little figurine to have and cherish in person, instead of looking longingly at the image on my computer monitor?" And to that, I say, "Oh, it's simple!" Simple, yes, but not easy: Sega is giving the Ryo Hazuki figurines out as part of a sweepstakes to celebrate the launch of Sonic & Sega All-Stars Racing. Only 1,000 of the figurines will be made, with 75 of them being available to Canada and the United States in the aforementioned sweepstakes - and a further 50 going to Sega's European community team to give our friends across the pond a (very slim) shot at getting their hands on this rare treasure. This treasure that will sit on your mantle and taunt you with the knowledge that Sega will probably never continue the series. So maybe it's all for the best if you don't get one.